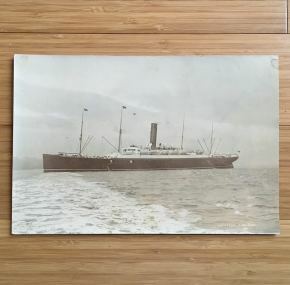 Impressive real photo of Cunard’s Ivernia of 1900. This large photo shows the ship in Liverpool just before WWI. Note the distinctive brown painted band just under her white superstructure. This was a feature of Cunard liners in 1914 that did not return after the war. The image measures about 11″ x 7″ and is in very good shape. Needless to say it would scan marvelously.